It happened. 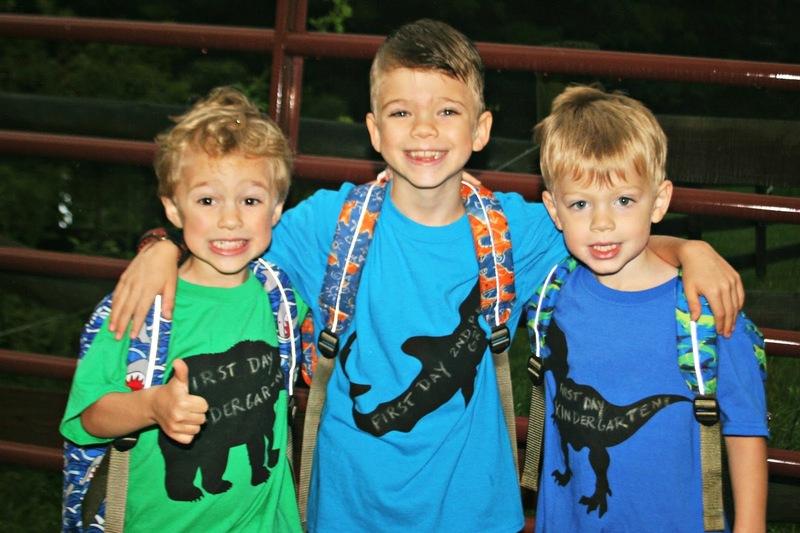 All three of my boys started school yesterday. It's hard to believe the twins are old enough for kindergarten this year. They have the same teacher that Pierce had, so I know they are in good hands. The past couple of weeks we've been getting ready, and one of the things I love to do in preparation is label everything with Mabel's Labels. 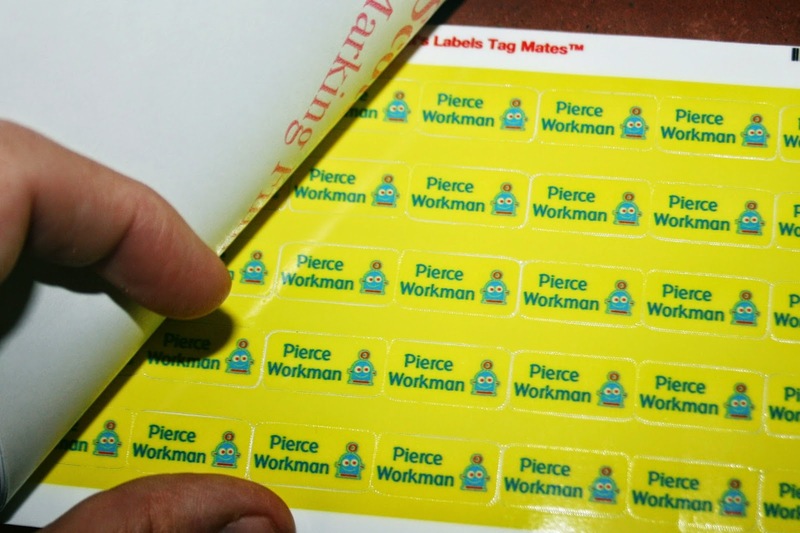 I've been using these labels on the boys' possessions for a couple of years now. I can say that they are very durable - they can go through numerous washings and there is no sign of wear - they retain their vibrant colors, they don't come off, and they do not fray. They offer various packages, but we like the Ultimate Back to School Combo. It comes with 3 different styles of labels, plus a couple of metal hang tags that are perfect for backpacks and winter jackets. You can pick your colors and a small image for your labels. 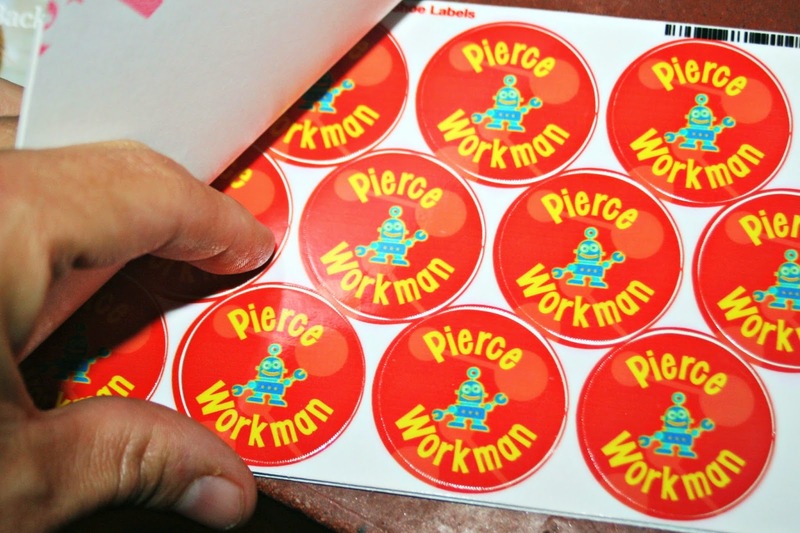 Since Pierce is so into robots, it was an easy choice for him this year. 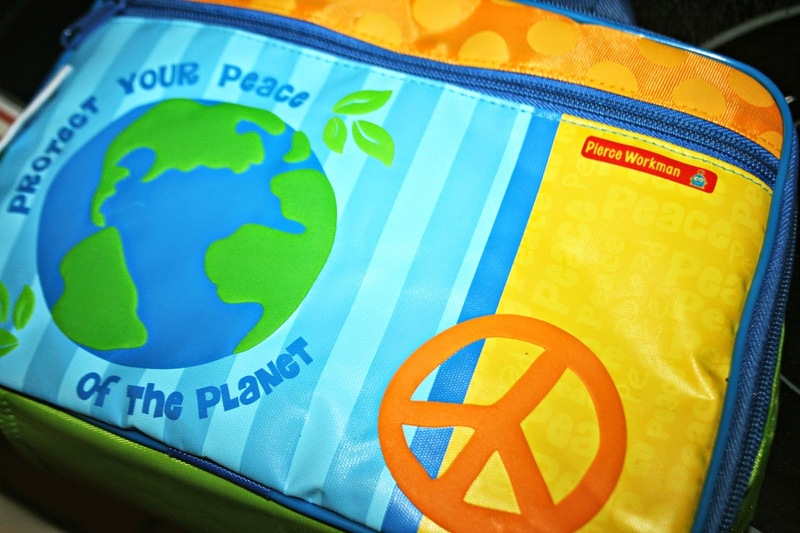 I stick them everywhere - lunchboxes, pencil boxes, water bottles, paint shirts - they go on pretty much everything! Yes, readers, I had all the school supplies in order, and everything neatly ordered. The only thing that wasn't prepared to watch these boys get on the bus and head off was my heart. I hope they all have a wonderful school year! Disclaimer: I received a set of labels for review purposes. The opinions above are my own. you are going to have a empty home. School starts here next week. dat zier er heel goed uit. Your boys are just the cutest EVER!! Sounds and looks like the perfect labels for them. The labels are so cool! Wishing the boys a great year! Now don't blink, because time will fly so fast and they will be going off to college before you know it! Oh my goodness they are soooooo big! I wish them great success. It is a big deal to go to school full time. Gives you a little time. Mine went back Monday and now I have a little vacation! God bless them! I know about those heart strings, Lisa. It's like you just can't understand how quickly the time goes. and I bet the boys loved them too! We hope they had a great day at school-- what a cute photo! These labels are awesome! I want them, and I am an old lady!! The first picture is just beautiful, that is one to fame. My son takes a picture of our granddaughter on the first day of school, he takes one every year in the same place with the same pose. That photo of all of them getting on the bus tugs at my heartstrings. Oh, Lisa, I know that must have been hard and happy all at the same time, to see them get on that bus. They are such sweeties, and I know they are well prepared. I hope they all have great years!! They all look so sweet getting on the bus! Aw, look at 'em getting on the bus. I love that picture. 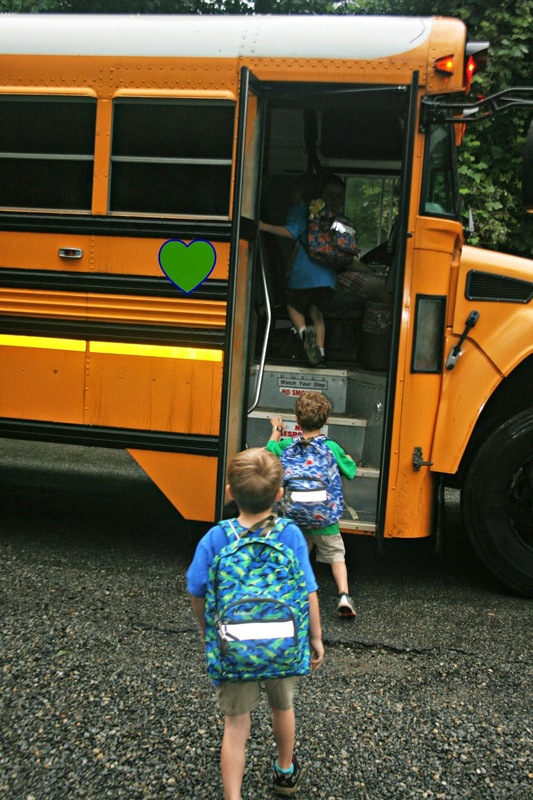 What a great moment the boys will all be able to laugh about and remember forever...boarding the school bus together for that first day of school. My Kindergarten teacher (looking back at my class photo, she reminds me of Catwoman from from the Batman movie series) switched to First Grade. So I had her two years in a row. I thought that was pretty cool! That looks great. Thank you for sharing them. You've done well finding all these sponsors! Good for you! Awww...they look so cute in that first photo! They all look like brothers. I bet you'll miss the twins being home. It will be nice having time to work, or just for yourself. Did it make you sad to see all three boys leave home that first morning???? That's a big change for you.... These 'passages' in life can be hard... Just wait 'til they leave home and go away to college... That was HARD too. Aw, the boys looks so fine! Good idea, I'm sure I'll want to label everything as well when our kid is old enough.